Electric shavers represent a practical and convenient alternative to traditional wet shaving. And while there is a lot of information available on how to choose, use and care for an electric razor, there are still quite a few questions and myths surrounding this topic. As a result, we’ve put together a comprehensive list of commonly asked questions regarding electric shavers. Feel free to use the content table below to jump straight to the part that interests you the most. 1. Do electric shavers cut as close as manual razors? 2. Do electric shavers cause less skin irritation? 3. Do electric shavers exfoliate the skin? 4. Do electric shavers cause ingrown hairs? 5. Do electric shavers make the hair thicker or the skin darker? 6. Can you shave your head with an electric razor? 7. Do electric shavers work on legs/pubic hair/armpits? 8. Do foil shavers give a closer shave than rotary razors? 9. Do electric shavers need shaving cream? 10. Can electric shavers cut you? 11. Can you use an electric shaver in the shower? 12. Should you wash your face before shaving with an electric shaver? 13. Can electric shavers be shared between users? 14. 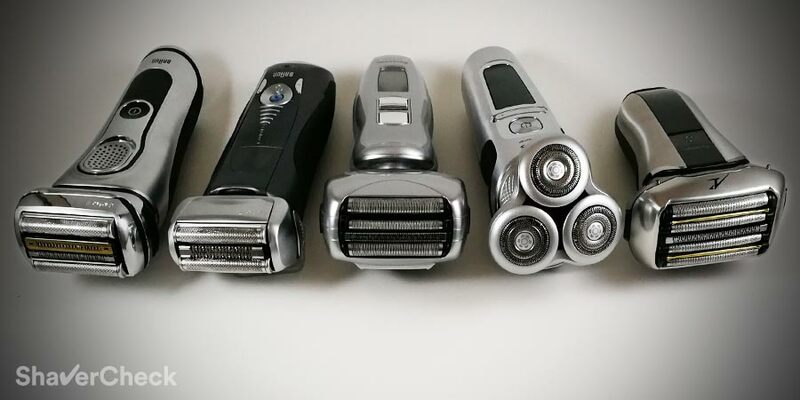 Are electric razors faster than traditional shaving? 15. Do you still need to use an aftershave with electric razors? 16. How often should you change the blades on an electric razor? 17. Can electric shavers be sharpened? 18. Can you clean an electric shaver with water? 19. Do you need to oil an electric razor? 20. Can you use an electric shaver while it’s charging? 21. Do you have to discharge an electric shaver (through use) in order to maximize battery life? 22. Why do electric shavers have different plugs? 23. Are electric shavers allowed in carry-on luggage on airplanes? 24. Why do you have to wait three weeks for your skin to adapt to an electric shaver? 25. Can you return an electric shaver? Because there’s a physical barrier between the actual blades of an electric razor and your skin — in the form of a micro-foil or a comb — a manual razor will usually provide a closer shave. However, traditional wet shaving also comes with its own (significant) drawbacks and modern electric shavers have a come a very long way with regards to closeness and comfort. As a result, most users will likely be perfectly satisfied with the closeness provided by a high-quality electric shaver. And with a few adjustments to your technique and shaving routine you can improve your results even more. The short answer is yes, generally an electric shaver will be more comfortable and thus better for sensitive skin compared to using a blade. Some electric razors are better than others in this regard, being gentler, more forgiving and less prone to cause irritation or razor burn. Braun foil shavers are almost unanimously considered to be the most comfortable out of the big three brands (Panasonic and Philips Norelco being the other two). To a very small degree, yes. You cannot compare it however to the exfoliation you’ll get from using a razor blade. Small bits of skin can poke through the perforations in the foils or combs and a very shallow layer of skin cells will be scraped off as well. But it will be very spotty and in some cases, this can result in razor burn if you press too hard. As a result, it’s a far better approach to only use light pressure and exfoliate your skin twice a week using a gentle facial scrub. Shaving can sometimes lead to ingrown hairs and even razor bumps regardless of the method you choose. However, it is less of a problem if you use a suitable electric shaver and exfoliate your skin regularly. Because electric shavers don’t shave quite as close and the hairs are also cut clean and straight, there are fewer chances of them curling back into the skin and becoming ingrown. If you’re already dealing with acne or razor bumps, an electric shaver will arguably be a better and safer choice. You don’t want an exposed blade to be dragged over infected bumps. No, they don’t. This is yet another myth that only has to do with appearance. A razor blade will often cut the hairs at an angle, while an electric shaver will cut them straight, making the hairs appear thicker and darker when they start growing back. It’s scientifically proven that shaving does not affect the thickness, density or color of the hair follicles, regardless of the method of shaving. Yes, absolutely. In fact, it’s arguably a faster, safer and overall better method of shaving your head. You can use a regular electric shaver for this, be it foil or rotary, or go for a dedicated head shaver like the ones from Skull Shaver. Electric shavers are designed to cut short, coarse hair. As a result, they’re not ideal for shaving body hair. You could theoretically use an electric shaver provided that the hair is very short, but you’ll be better off with a body trimmer. Generally yes, foil electric shavers will shave closer. While there are men who get excellent results with rotary shavers and they swear by them, most users will have a better chance of getting a closer shave using a foil shaver. The micro-foils are a lot thinner than the metal combs found on rotary razors, meaning there’s a thinner barrier between the skin and the actual blades. This often results in foil razors providing a closer shave. No, electric shavers do not require shaving cream. You can optionally use shaving cream/gel with your electric razor if it’s suitable for wet & dry operation. Some users do get improved results in terms of closeness and comfort, so if your particular shaver can handle wet shaving, you can give it a try and see if there are any improvements to your results. Yes, an electric shaver can still cause small nicks and even some nasty razor burn. It’s a lot less likely to happen compared to using a razor blade, but it’s definitely possible. The best way to avoid this is by not pressing too hard. If you apply excessive pressure, tiny bits of skin tissue surrounding the hair follicles or other small imperfections in the skin will poke through the holes and slots and get cut by the blades. If your electric shaver is waterproof and explicitly marketed as suitable for wet/dry use, then yes, you can safely use it in the shower. If you’re going to shave dry (and most users will), then you should NOT wash your face or take a hot shower right before your shave. This will have a negative impact on your results. A pre-requisite of a great dry shave is to have your skin as dry as possible. Just like manual razors, electric shavers are intended for personal use only and should not be shared between users. Skin infections and bacteria like Staphylococcus aureus can still be transmitted. Also, some germs can be present in the skin without any obvious signs of infection, so never share an electric razor with someone else. In most cases, yes. A decent electric shaver will shave faster than a blade, especially if you shave dry. With electric shavers, the prep-work is virtually non-existent: no washing your face with hot water, no showering or lathering required. An electric shaver is also a lot more forgiving, allowing you to shave faster. You also don’t have to constantly rinse the razor or re-lather your face. Mid-range to high-end electric shavers are fitted with very fast motors and have multiple cutting elements. As a result, they will usually shave very fast, even in the case of coarse facial hair. Entry-level electric razors will require more strokes in order to get a clean and close shave. They also work best on short beards, so they should only be considered a viable option for daily use or if you have light to medium facial hair. You don’t need an aftershave, but it’s highly recommended to use one regardless if you’re shaving with an electric or a manual razor. Post-shave treatment should be an integral part of your routine as the skin needs to be moisturized and hydrated after subjecting it to a potentially irritating process. The answer is as often as you need to. All manufacturers will recommend a default interval to replace the blades and foils/combs, like every year or every 18 months. However, this is highly dependent on the coarseness of your hair, how often you shave and how well you take care of your shaver (cleaning, lubrication). As a result, you may need to replace the parts sooner or later than what the manufacturers say. When you’ll notice a performance drop that will gradually become more noticeable — the closeness of the shave is not as good anymore, the foils get excessively hot, the hairs are yanked and you’re getting razor burn — it’s probably time to get new blades and foils. The short answer is no, the blades of an electric shaver cannot be sharpened by the user. Even if someone would have access to the highly specialized tools required to perform this operation, it would still be futile. And that’s simply because the wear caused by the friction between the blades and the foils or combs makes any refurbishing attempts impossible. The blades and foils of an electric shaver are machined with great precision and have very small tolerances. With use, the metal will wear out, warp and the gap between the blades and foils will gradually increase, thus affecting the closeness and leading to the hairs getting yanked. Trying to sharpen the blades will actually make this worse. The only viable solution is to replace them with new ones. If the shaver is waterproof, yes, you can and you should clean it with water. And most modern electric shavers are waterproof. Using warm tap water to clean an electric razor will be very effective, especially if you add a bit of liquid soap too. You should find very detailed instructions in your user’s manual on how to properly clean your shaver. Yes, it’s highly recommended to lubricate your electric shaver in order to ensure optimal performance and to prolong the life of the blades. If your shaver comes with an automatic cleaning station and you use it on a regular basis, there’s no need to lubricate the blades manually since the cleaning solution also acts as a lubricant. Otherwise, you should use either a light oil (clipper oil, sewing machine oil) or an electric shaver cleaner and lubricant spray. Some manufacturers like Braun and Panasonic also include a small bottle of lubricant with some models, but that’s generally not the case with most shavers. Here’s a complete guide on how and when to lubricate your electric shaver. Most dry only electric razors will allow you to shave with the cord plugged in. This can be convenient if the battery is completely drained or when it can’t hold a decent charge anymore. Wet & dry electric razors will only work cordless as a safety precaution. However, most of them have a 5-minute quick charge function that will allow you to complete one shave. While the batteries aren’t user replaceable in most cases, you can often find the compatible batteries and replace them yourself. Keep in mind though that doing so will likely compromise the waterproofing of your shaver and void any remaining warranty. Most of today’s electric shavers are fitted with modern batteries that don’t require complete discharge cycles in order to prolong their lifespan. This was known as the memory effect. Li-ion batteries, the type most commonly used in electric razors, have a finite number of charging cycles. However, a partial cycle only counts as a partial cycle, so charging a shaver more often is not a problem anymore. Some older or entry-level shavers like the Braun Series 3 are fitted with NiMh batteries that do require a complete discharge every 6 months or so, but that’s about it. Because electric shavers are sold in different parts of the worlds, a particular model can come with different plugs depending on your location. However, you can for example use a USA electric razor in Europe with a simple plug adapter. That’s possible because pretty much all electric shavers are fitted with automatic voltage converters, allowing you to charge your shaver anywhere in the world. This information will be explicitly listed on the box or in your user’s manual. Yes, an electric razor is allowed in hand luggage and checked baggage as well. If your electric shaver is fitted with a travel lock, make sure it’s activated. It’s also a good idea to have a hard travel case that offers protection in case of mechanical shocks since checked baggage is often handled roughly. If the manufacturer didn’t include one with your razor, there are often third-party cases available for the most popular shaver models. You must have come across something like this when browsing through your shaver’s user guide. Manufacturers assume that you’re probably switching from a manual razor and advise you to wait at least three weeks before drawing a conclusion. As we know, using a razor blade will also scrape off a tiny layer of skin cells, which in turn triggers your body to produce scar tissue. Since it takes a few weeks to get rid of that scar tissue, during this time your results with an electric shaver won’t be the best. So that’s the reason why you should wait for approximately three weeks and allow the skin to get used to the new shaver. Most manufacturers offer the possibility of returning an electric razor after using it if you’re not completely satisfied with its performance. The terms and conditions can vary quite a lot among different manufacturers, different countries and different shaver models. Also, a particular trial offer can only apply to shavers bought within a specific period of time. The terms are subjected to change quite often, so make sure to do some research before buying a particular shaver model. You’ll usually get between 45 and 60 days from the date of purchase to apply for a refund. I was really satisfied after reading through your website, you gave very detailed review on almost everything i want to know about electric shaver. I was thinking of changing the blade or upgraded to panasonic arc 5. Thank you for your kind comment, I really appreciate it. For most users, a Panasonic Arc 5 will provide a noticeable improvement in closeness compared to a mid-range Philips shaver like your S5420. I also think that it would be more comfortable (I personally get much better results using foil shavers). The only thing to keep in mind, especially when shaving your neck, is that if you have lots of flat-lying hairs that grow in different directions, Panasonic shavers are not as good at catching them as Braun for example and will require additional strokes. This is mainly a problem if you shave less often and the hairs are excessively long. I shaved dry and i am a hairy person, and need to shave everyday. However my beard and hair are just normal. My main concern is to upgrade to a shaver that able to get close shave, easily maintain and able to get spare parts replacement in the future. Do you suggest braun or Panasonic arc 5? You are very welcome. If you shave daily and the closeness of the shave is very important, I’d go with the Arc 5. Sorry for the late reply, for some reason I wasn’t notified of your comment. I am thinking to buy lv6q. The price around 190 to 200 usd. I want to ask regarding the foil and blade replacement? It is easy to get and it is expensive? Another question is i found fron the website that the replacement outer foil should used wes 9177,inner blade wes 9170 and whole set wes 9036. Is there any other option? If not mistaken you mentioned that all arc 5 are backward compatible. It is true? Between the ES-LV6Q and ES-LV9Q I would also go for the former. The station is not really necessary and you’ll also save some money. Regarding the replacement parts, those are indeed the correct part numbers for the foils and blades that come with the ES-LV6Q/ES-LV9Q, but there are other compatible parts as well, including the ones of the slightly older revision A and revision B Arc 5 models (the set has the part number WES9034P). Also, the set of the even older second generation Arc 5 will fit (part number is WES9032P). So you basically have 3 options to go for (depending on price and availability). So I wouldn’t worry too much about it. The only thing I worries is regarding the replacement part and durability of the foil. From. 1.FROM Your experience how long the foil can last before need replacement? With proper cleaning and lubrication, they should last at least one year of constant use. I highly recommend a cheap spray lubricant (like Remington Shaver Saver or Braun spray cleaner), they really make a difference to the performance and longevity of the blades. Again great site! Another question I’ve been sometines asked is a comparison of the “green” aspect of DE shaving compared to an electric, and my personal opinion is that it’s a wash. With a DE there’s the issue of disposal of blades, which in some areas is considered regulated medical waste. In any case there is the ongoing problem of dumping sharp (they should be in a sharps container of some sort), potentially contaminated razor blades into commercial waste, and collectively it can add up to a lot. With an electric, you’ll dispose of the head every year or two – plastic and steel, but not usually considered hazardous waste. On the other hand, the shaver itself with its (probably) lithium ion battery must be disposed if every three years or so (likely a lot longer, but the usual warranty), so that becomes an issue depending on local laws for disposal of Li-ion. You pays your money and you takes your choice, but either option – electric or traditional DE blade – is not completely “green.” I suppose the true environmentalist would use a straight razor, but there’s that extra cost for emergency room visits…. Thank you, Allan. That’s a great question and some great insights on this matter. I completely agree with your stance on this.